The USB adapter. Picture courtesy of L3 Systems. Physical hookup is simple. One end of the supplied cord goes into the reciever, the other end goes into the keyboard port on the back of your laptop. Once you have the remote, it doesn’t take long to customize. As it comes out of the box, if you press a button on it, it sends PAGE DOWN or PAGE UP to the computer. This is for running Microsoft Powerpoint; Page Up and Page Down flip through Powerpoint slides. - Go back one track. - Fade out current track and stop playing. Left Button: Fade out current track and stop playing. Both buttons: Go back one track. It’s harder to press both buttons at the same time, so I’ve put the least-used command there. My main use of the fadeout and stop command is for tracks that are played when people come up on stage from the audience. These tracks cover the time as someone is walking up, and you never know exactly how long they’ll take, so you just fade out the track when they’re up on stage. Here’s some info to help you with what’s on pages 3 - 5 of the Key RF manual. You need to use a keyboard with a PS/2 connector to plug into the KeyRF. These are cheap at office supply stores. 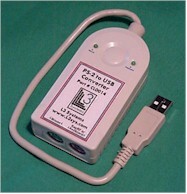 First, plug the receiver into a computer (using the USB dongle if you have USB ports), plug a keyboard into the receiver, then turn the computer on. Windows XP users: Go to the Start menu, select Programs, then select MS-DOS prompt. Windows 7 users: Go to the Start menu, select Programs, Accessories, then select MS-DOS prompt. Once you have the MS-DOS window open, press Left Shift and then Right Shift alternately (on the external keyboard plugged into the remote!) until the prompt shown on the bottom of page 3 of the manual is displayed. Finally, press Q to quit. The remote is now reprogrammed. You can close the MS-DOS or SimpleText window.